It takes time to implement change. It takes time to analyze your students’ performance so you can determine what worked well and what needs to be modified or improved, added or deleted. It takes time, and sometimes peer assistance to figure out how to make the changes that you know you want in your course(s). 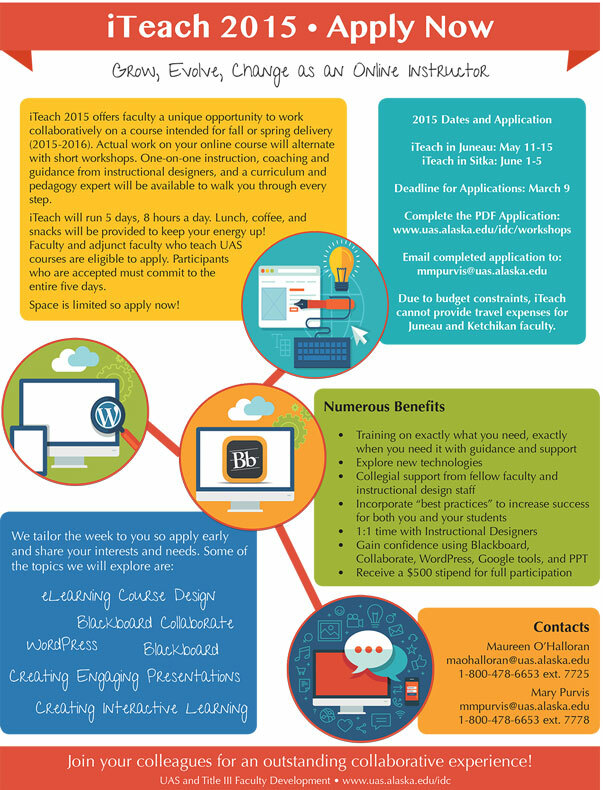 iTeach 2015 might be the perfect solution for you! What makes iTeach so special? Concentrated time to explore ideas and find solutions to your teaching needs with the help of instructional designers and peers. Group and one-on-one assistance with building content for your course(s). iTeach 2015 is NEW–even if you’ve attended an iTeach in the past, you’ll find this week different from past experiences in both content and structure. Come JOIN us for the new 2015 iTeach!!! I think I may be overlooking the application. Can you point me in the right direction? Glad you’re thinking of joining us. Please spread the word!